I'm currently studying for my RHCSA certification. As part of the exam I will need to work with KVM virtual machines, which require a proper piece of hardware to run on. Sadly I haven't been able to boot CentOS off a USB drive on my Macbook, despite numerous attempts. I've had a number of great tutorials, but no dice. Luckily my colleague Peter (not the one of the iMac) came to the rescue! He runs a sandbox system at home, which is a great playground to study for the RHCSA. He gave me an account and permissions to fiddle with KVM. 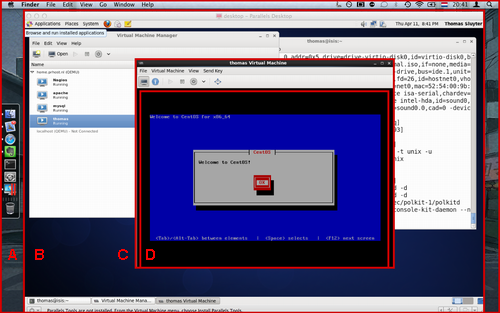 ... running a CentOS virtual machine (D). The deeper you go the more oldschool it looks!